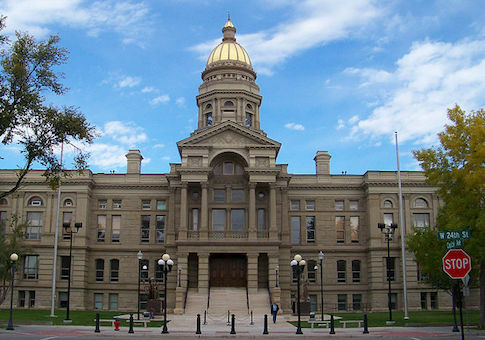 In 2019, the Wyoming state House will weigh whether or not their state should become the 21st to end capital punishment. A bill introduced by State Rep. Jared Olsen (R.) would abolish the death penalty in the state and replace it with a maximum sentence of life without the possibility of parole (LWOP), the Wyoming Tribune Eagle reported. Olsen told the Tribune Eagle that his decision was partially motivated by a concern for cost—death penalty trials costs can run into the millions, a bill footed by the taxpayer. "I think when members looked at how much we spent, I think that sells a lot of people really quickly," Olsen said. State legislators have tried to repeal capital punishment in Wyoming every year since 2013, the Casper Star Tribune reported. But past bills were generally minority efforts from Democrats in the legislature's lower chamber. Olsen's bill, by contrast, has the backing of Republican leadership, including House Speaker Steve Harshman, House Majority Leader Eric Barlow, and House Majority Whip Rep. Tyler Lindholm. It also has the support of a bevy of abolitionist groups, including the American Civil Liberties Union, the Roman Catholic Dioceses of Cheyenne, and the Wyoming League of Women Voters. Although capital punishment is a live issue in the state legislature, Wyoming barely uses the death penalty to begin with. Just one person—Mark Hopkinson, convicted of the bombing death of a family of three and the murder of a fourth 15-year-old girl—has been executed in the state since the death penalty was reinstated nationwide in 1977. In 2014, a federal judge vacated the sentence of Wyoming's last capital offender, Dale Eaton, leaving Wyoming's death row totally vacant. The state's low homicide rate—there were just 15 murders there last year—means it is likely to remain so. Still, repeal has an uncertain road ahead of it. Olsen's bill has the support of four Senate minority Democrats, including their leader, but will still need to pass the Senate and garner the support of newly elected Governor Mark Gordon (R.), who has not publicly commented on the proposal.